A shocking $50,000 top-prize win before dinner arrived had Lisa Jacobs and David Fisher asking for carryout. 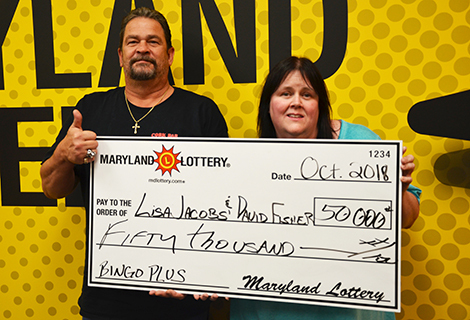 Enjoying scratch-offs as an appetizer while awaiting the main course at restaurants is standard fare for Lisa Jacobs and David Fisher of Baltimore. After picking out a $5 Bingo Plus game from nearby Maiden Choice Liquors, the couple went to a restaurant, ordered dinner and began scratching away. They were anticipating the arrival of their dinner, not Lottery riches, and certainly not the top-prize win that appeared. “Honey, I think we just won $50,000,” David remembers whispering to Lisa. When their dinner did arrive, the two were still so shocked over the big scratch-off win they asked to have dinner packed up to take home. A major home repair project tops the Baltimore couple’s to-do list. “Lisa has been saying for a few weeks now that she wants the bathroom redone before Thanksgiving,” David said. “I wasn’t sure we could afford what she had in mind. I’d been looking into getting a loan earlier this week.” Thanks to the Bingo Plus win, no loan needed! The $50,000 prize they claimed last week was the fifth that Bingo Plus players have discovered since the game’s debut in September 2017. Two top prizes remain in the $5 game along with four $10,000 prizes. Maiden Choice Liquors is also seeing green! For selling a $50,000 top-prize scratch-off, the Baltimore store earns a bonus of $500 from the Lottery.